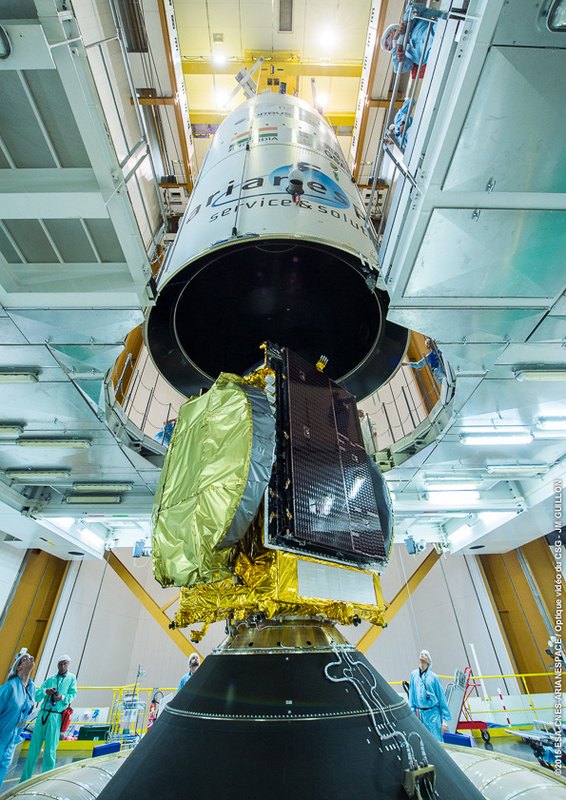 The Ariane 5 for Arianespace’s sixth heavy-lift mission in 2015 is now complete after the integration of its dual-satellite payload at the Spaceport in French Guiana. Flight VA227’s upper component – consisting of Arabsat-6B, the Sylda dispenser system, and Ariane 5’s protective payload fairing – is lowered over GSAT-15 during activity in the Ariane 5 Final Assembly Building. This activity occurred in the Ariane 5’s Final Assembly Building, where the GSAT-15 satellite was installed atop the launcher’s cryogenic core. 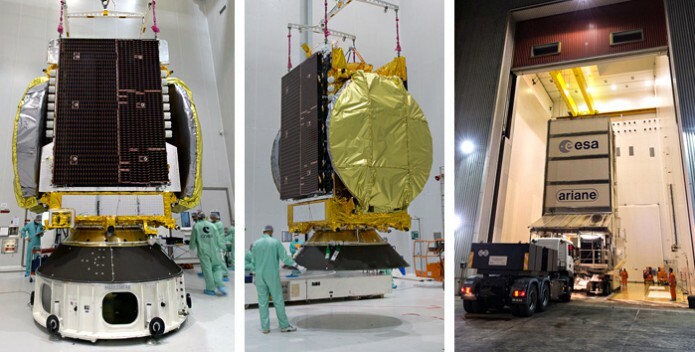 It was followed by placement of the mission’s upper component – consisting of Arabsat-6B, the Sylda dispenser system and Ariane 5’s protective payload fairing – over GSAT-15. With the launcher’s build-up now complete, final check-out will be performed in the coming days, enabling the mission’s launch readiness review on November 6. The Ariane 5 is to be transferred from the Spaceport’s Final Assembly Building to the ELA-3 launch zone on November 9, clearing the way for an evening liftoff on November 10. GSAT-15 is designed to provide telecommunications services, as well as dedicated navigation-aid and emergency services, for India. Built by the Indian Space Research Organisation (ISRO), it has a liftoff mass set at 3,164 kg., and will be the 19th payload launched by Arianespace for this space agency. 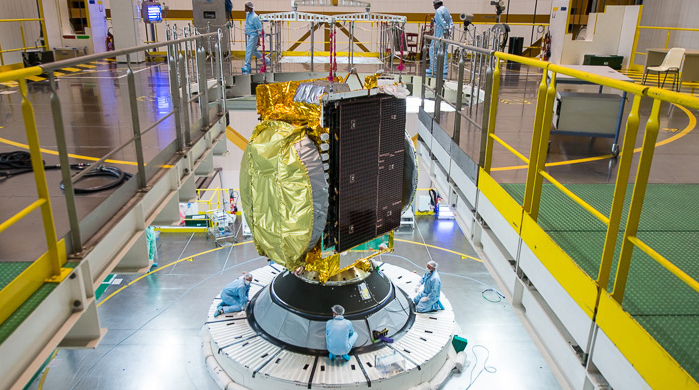 Arabsat-6B will be lofted for Airbus Defence and Space and Thales Alenia Space as part of a turnkey contract with Saudi Arabia-based Arabsat. To be renamed BADR-7 once in orbit, this spacecraft is the first of a sixth generation of satellites to join the Arabsat fleet, and the ninth orbited by Arianespace for operation by Arabsat. The relay platform will provide broadcast, broadband and telecommunications services over the Middle East, Africa and Central Asia, and has a liftoff mass calculated at 5,798 kg. The November 10 mission is designated Flight VA227 in Arianespace’s launcher family numbering system and keeps the company on track for a record 12 launches in 2015 using the heavy-lift Ariane 5, medium-lift Soyuz and lightweight Vega. India’s GSAT-15 is shown installed atop its Ariane 5 in the Final Assembly Building’s upper level. With this passenger in place, the launcher was ready to receive Arabsat-6B, which previously was integrated in Ariane 5’s payload fairing along with the Sylda dispenser system.